Tuesday in the Queens Park Crewe a dog running loose was after wildlife and I asked they put it on the lead politely. She went to the dog warden who was outside the park in her van. She told her SPECIFICALLY you don’t need to have it on the lead and you can let it loose around children in the child’s play area. This makes the park unsafe for anyone afraid of dog, children and wildlife it only takes a second for a big dog running loose to kill a child. It will be unsafe to have the park run with dogs running loose as dogs often chase runners. She specified this applied to ALL CEC open spaces not just the park. I asked about the local bylaw on the park and she said the new rule over rids it. I went on CEC website and found her information according to the website was wrong as it states dog must be on the lead. I made an official complaint and the reply from CEC says she was correct and the website was wrong. Thank you for your email with regards to dogs off the lead in Queens park. 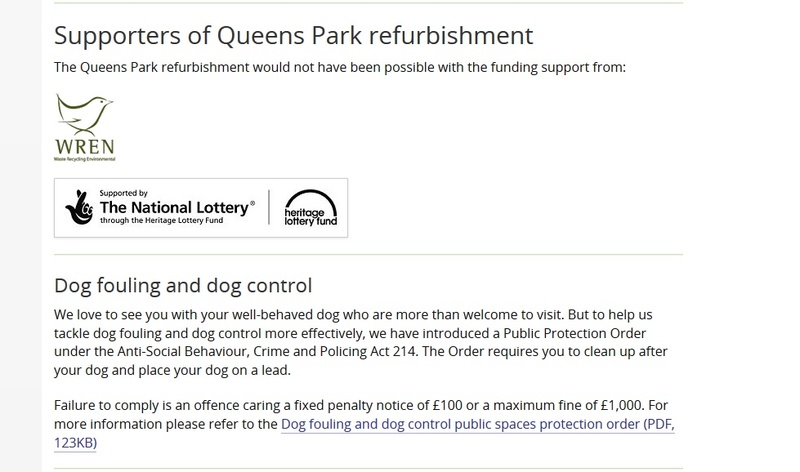 The officer that you spoke with on the 15th of January was correct in what they were telling members of the public with regards to dogs being allowed off the lead in the park, the link that you have provided is misleading and has been highlighted as an error and we have requested an urgent amendment to the website from the Parks and Development management team. The legislation that covers the parks and in fact all public open spaces throughout Cheshire East is as follows. This order covers dog fouling and also dogs on leads by request. Some of the parks in Cheshire East do have their own rules but these are not enforceable by our officers or under current legislation. This means if you’re a parent with young child you can go to any child’s play area and then people come and enter with big dogs off the lead. If the dogs then started fighting you and your child could be trapped in the area or if a dog attacks a child in a swing they cant run or fight. The same applies to wildlife which in many areas can be legally protected. Many people are frightened of dogs and will be terrified seeing them roaming free.